Europe undergoes a threefold crisis: a crisis of identity, of solidarity and of legitimacy. Underlying these three there is the adjustment of our economic and social system. An adjustment that causes real social damage. 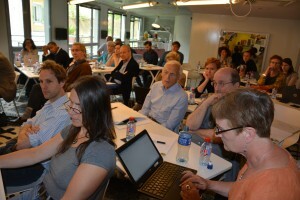 The seminar started with an overview of the social damage of the crisis. Ides Nicaise, scientific coordinator of the RE-InVEST-project will summarize the first findings of the project. These focus on the impact of the consequences of the crisis on vulnerable people. Their lives are a barometer of the implementation of the human an social rights. To begin with this overview is a point of reference for this seminar. Saskia Sassen’s latest book, Expulsion, emphasizes the structural deficiency of our society: since the eighties our system is based on exclusion of expulsion in stead of inclusion? She describes different examples of expulsion. expulsions who are the result of the economic crisis, like the expulsions from home, but also expulsions who are a result of globalisation (the expulsion from land in Africa) or expulsions through ecological disasters created by our system. Each kind of expulsion is driven by our economic system who creates a world of ‘superfluous man’. Pierre-Noel Giraud, professor at CERNA, France, develops a similar idea in his book, l’homme inutile, the useless man. How can we create a system that avoid uselessness? is the main topic. A journey into the depths of economic thinking. The idea of expulsion is what Laurence Fontaine in a previous seminar described in her book, the market a social conquest. She concluded that regulation was used to exclude the poor from the access to the market. Exclusion is a structural phenomenon. To regulate is to exclude. even deregulation is a form of regulation, it privatize the regulation. Deregulation creates new regulations, regulations made by firms to optimize their profits. Rich Moth from the Liverpool Hope University and Hans Uwe-Otto from Bielefeld University have discussed the consequences of deregulation on mental health and on social services. With Saskia Sassen we can conclude that the privatization of the regulation leads to a loss of social and human rights. To regulate can also be to include. During the previous seminars we emphasized the need of regulation. Peter Bartelheimer from the university of Goettingen summarizes a research on activation in Germany. What lessons can be learned from 10 years of activation? A key concept inside the degrowth literature are the ‘commons’. The commons are a bottom-up answer. an answer from the streets to the challenges who don’t get any answer from the political world. In Greece for example are the commons an answer to the disinvestment caused by the austerity measures. Dora Teloni from TEI department social work, give a insight into the Greek world of commons as an answer to disinvestment but also an answer to develop a democratic society. Jean De Munck from the University of Louvain analyses further the need for a democratisation. He emphasizes the need to democratize the big corporations. The search for a new foundation lead us to the question of democracy. Regulation and deregulation, expulsion of exclusion and inclusion, defining the notion of well-being, working together, … these are all aspects of the question of how to democratize our society.